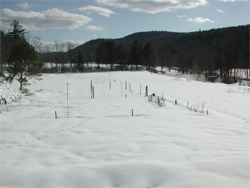 Here is a general overview of what happens throughout a season here in Southern Vermont. We start out with an empty field covered with snow and ice. Gradually the snow melts and fields dry out. Plants begin to grow. Wildflowers such as Hepatica, Wild Ginger and Bloodroot bloom. Little by little the field transforms itself from a barren plain to a mass of blooms too numerous to count. Below is an accounting of what happens when.We will update this as time goes on. April: This is a good time to buy, divide and transplant all daylilies as they will recover and bloom well this year. This truly the beginning of the outdoor growing season. While we can still get snow, it typically melts fast and the daylilies begin to shoot up. Daylilies: Nothing is blooming now but shoots are coming up everywhere. Perennials: The Forsythia begins blooming. May: This is still a good time to get a fresh start on all but the earliest of daylilies. Daylilies and Iris really shoot, with real warmth the plants grow quickly. If the conditions are right there may be some blooms on a few of the early daylilies. Earlianna, Hem. dumortieri and Early Bird may occasionally begin bloom in late May. Daylilies: Many of the early blooming daylilies will produce scapes and some can be damaged by a severe frost. Iris: Iris are striking at how fast their scapes grow. While daylilies appear first the Siberian Iris grow quickly and overtake the daylilies. Perennials: The Violets are really showy this time of year with the many species all blooming in succession. Trilliums, Primrose and bloom now. The Lilacs are in full bloom by late May. Early June: The fields are beginning to look spectacular with a variety of flowers blooming throughout the property. This is still a excellent time for transplanting. Hostas are almost fully leafed out, the Iris are a mass of buds and the field is full and lush. Daylilies: A few surprises each year but the usual players, H middendorfii, Little June and many of Chris's Early hybrids produce first blooms. Perennials: Tiarella (Foamflower) and Papaver atlanticum are notable here. Mid June: The fields look better every day! There is more to see daily. The early daylilies are opening daily. Now there are scapes everywhere. Daylilies: Hem. lilioasphodelus, Hem middendorfii and other species are in full bloom. Iris: Most of the Siberian Iris are in bloom as is Iris setosa. Perennials: Baptisia australis and Blue Geranium species is in full bloom. Syringa josekii (Hungarian Lilac) blooming. Late June:Transplanting of many daylilies will still result in good blooms this year. The Blueberriy bushes are loaded with green berries and even a few blue. There is actually a lull in blooms with the daylilies but the mass of scapes is staggering. A new bloom appears every day. Daylilies: Little Rosy Cloud, Sweet Georgia brown and Care Free Peach are notable different colored daylilies. Iris: The Siberian Iris are finished with the exception of Lime Heart and a few others. The Japanese Iris are just beginning. Perennials: Aruncus dioicus is putting on a show. The masses of beautiful plumes are spectacular. Early July:Blueberry season begins with the first of the early varieties ripening. From here on the field changes daily with new daylilies opening. Daylilies: Probably 2-3 new cultivars opening daily. Iris: The Japanese Iris are in full bloom. Perennials: Astilbes are in full bloom. Mid July: Peak Season thousands upon thousands of blooms with over 5 acres of beds there are flowers as far as the eye can see.This is a great time to come find that one special daylily! The blueberries are ripe en masse. Now the dayliles are opening by the dozens with thousands of new flowers daily of flowers. Daylilies: 20-30 new cultivars opening daily. Perennials: Delphiniums and Astilbe thunbergii are in full bloom. Late July: Each day is a new surprise with the new mass of flowers opening. There is still a mass of blooms in the field with new cultivars opening every day. Daylilies: 15-20 new cultivars opening daily. Still thousands of blooms opening daily. Perennials: Pink Mallow and Gloriosa Daisies are in bloom. Early August: Selecting daylilies from this period ensures bloom through that critical period when most perennial garden peter out. The number of daylilies is slowing but still there are many surprises. Daylilies: 10-15 new cultivars opening daily. Perennials: Echinacea is putting on a show. Mid August: The daylilies are still going strong but fewer are coming out. Daylilies: The talls like Autumn Minaret and Challenger are blooming. Perennials: Veronia is just beginning. Late August: The daylilies are still going thanks to the late bloomers. Just a sprinkling at this point but more opening everyday. Daylilies: Chicago Apache is one the last red saturated reds to bloom. Perennials: Phlox paniculata are in full bloom. Early September: This is the beginning of the late season. The lates are really coming into their own. The field is now dominated with pastel shades of the lates. Daylilies: The special selection developed by Dr George Darrow are in bloom complemented by a few stranglers from other breeders. Perennials New England Asters are making a show. Daylilies: Yellow Sights, Fall Pink Melon, The Last Melon and RR Red are a few of the notable lates. Late September: The daylilies are looking tired at this point except for the lates. Seed pods are prominent and ready for harvest. Daylilies: Shocker is usually the last daylily to bloom. The daylilies don't always open well after a frost. Early October: At this point the late daylilies are still struggling to bloom and the repeated frosts are making them smaller than normal.